Oyster Bay is swooping in for a quickie on Thirsty Thursday! This spot was reserved for a really cool wine from a less traditional place, but it was unfortunately corked. I cried, as I always do with faulty bottles, and I went to the wine fridge to pick out an emergency bottle not already scheduled on my calendar. So here it is! As you probably know, Oyster Bay's Sauvignon Blanc is a sales powerhouse and the favorite wine of little old ladies everywhere. But that's not all they make. 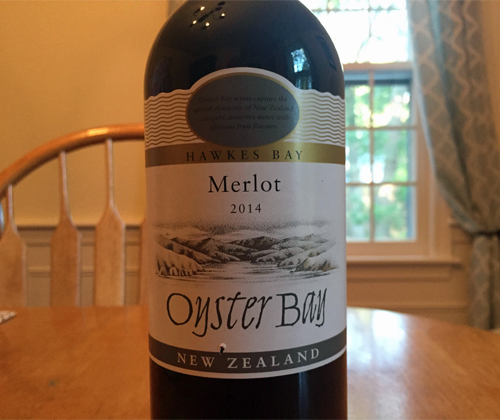 I've always really liked their Merlot, and my grubby little hands received the 2014 as a gift about a month or so ago. You may have noticed that this wine is from New Zealand's Hawkes Bay instead of Marlborough where their Sauvignon Blanc and Pinot Noir is from. Both are on the east coast of New Zealand but Hawkes Bay is on the North Island while Marlborough is on the South Island. The first vines were planted in Hawkes Bay in 1851 by missionaries, so they've been doing this for awhile. It's mostly a red wine region and you'll find some really awesome Cabernet Sauvignon, Merlot, and Syrah coming out of there. It has a stelven, AKA screw cap, to keep it nice and fresh. The color of the wine is ruby red with a slight little twist of purple in its highlights. On the nose there's aromas of plum, blackberries, toffee and tarragon. It's medium bodied with a slick mouthfeel, super soft tannin and bright acidity. There's flavors of blackberries, plums, cherries and caramel. Then it finishes with a burst of cherries and caramel and that bright acidity. Dude, $11? Hell yeah. And you can probably even find it for under $10, which would make it a must-buy Merlot for under $10. The bottle used was received as a personal gift from another wine professional. Using it to review for this website was my own decision. To have your wine reviewed follow this link.